People in love do everything in their power to please the one they love. This is the natural reaction of the heart that loves. It is not viewed as a duty, but a joy and privilege! This is what the true Sabbath means to all who love their Maker and wish to honor Him. At the very start of the world, the seventh-day was set apart as a day to rest and worship the Creator. Those who value the care showered on them by a loving heavenly Father, want to obey Him and worship Him on the true Sabbath day. Many people believe that there is no need for a specific day of rest since Yahuwah should be worshipped every day. Saturday sabbatarians believe that because Saturday is the last day of the modern seven-day week, it must be the true seventh-day Sabbath. Because modern weeks cycle continuously, they believe Saturday has come down uninterrupted from Creation as the true seventh-day Sabbath. Still others believe that an accumulation of Biblical and historical evidence reveals that the true Sabbath can only be found by using the luni-solar calendar used in Bible times. While it is true that one should worship every day, the sovereign of the Universe Himself expressly commanded that on the seventh-day, labor is to be set aside and special time spent with Him. The Sabbath is not just a day of worship. It is also specifically a day of no labor. Yahuwah even stated that the Sabbath is a sign between Himself and His children forever. This article will consider the evidence for whether the true Sabbath is a "Saturday Sabbath" or what is called a "lunar Sabbath." For all who want to know truth, there comes a time when the way divides. Personal prejudice, tradition and preconceived ideas should have no standing in the mind of one wanting to know "the Truth, the whole Truth and nothing but the Truth." If the seeker for truth will study with an open mind, being willing to obey what is revealed if he is convicted that it is truth, then truth will be revealed to his mind and he need not remain in error. This is what is required of all who would study the subject of the true Bible Sabbath. Scripture reveals that the entire conflict between the Creator and Satan is contained in the battle over worship. It is a war for the mind of every man, woman and child alive today. Therefore, it would be wise for everyone on earth to examine this subject for themselves. All should study and know for sure whether the true day of worship is a Saturday Sabbath or a Lunar Sabbath. History and archeology reveal that all ancient civilizations used luni-solar calendars. While the Egyptians were the first to adopt a strictly solar calendar, their original calendar was also a lunar-solar calendar. This ancient and highly accurate method of time calculation ties lunar months to the solar year by some observable point in nature. The movement of the sun, moon and stars is the only accurate measurement of time. Even with modern atomic clocks, all time is measured by the cycles of the heavenly bodies. Days and years are both measured by the rotation of light as viewed from the earth. Historical evidence shows that by far the majority of ancient calendars began their year in the spring, at or near the time of the spring (vernal) equinox. The Israelites also used a luni-solar calendar and began their year in the spring. Both their annual feasts and the seventh-day Sabbath were calculated by the lunar-solar calendar that had been established by the Creator at the very beginning of the world. The Creator's calendar is a vitally important tool for finding the true seventh-day Sabbath which contains the "seal of Yahuwah": one's pledge of loyalty to the Creator. Scripture reveals that at Creation, both the sun and the moon were given to provide light as well as the means for marking the passage of time. The modern solar calendar does not use the moon for keeping time. Nor does the Hindu or the Muslim lunar calendar use the sun. Only the ancient lunar-solar calendar meets the criteria of using both the sun and the moon in its system of time-keeping. Many people who keep the feast days listed in Leviticus 23 still observe a Saturday sabbath. They believe that the lunar-solar calendar was used only for the yearly feasts, but that Saturday of the modern solar calendar has come down in a continuous weekly cycle ever since Creation. But this is two different methods of time-keeping! Nowhere in Scripture are two separate and distinct systems of time-keeping mentioned. At Creation, one calendar was established and it required the use of both the sun and the moon. both the sun and the moon for tracking time. The Sabbath is the sign by which the Creator's people are marked and set apart as different from all others on earth. The Hebrew word that is translated "seasons" is even more revealing. It is the word mo'ed. It is the use of this word that reveals the true Sabbath of Creation is reckoned by the moon. Mo'ed is the word used specifically to refer to the annual feasts. Far from presenting two different systems of time-keeping, Scripture presents only one: the lunar-solar calendar by which the annual feasts as well as the seventh-day Sabbath, are to be calculated. Leviticus 23 is a listing of the holy feasts of Yahuwah. From the Spring Anniversaries to the Fall Feasts, Leviticus 23 delineates them all out. But the very first "feast" listed is the weekly feast: the seventh-day Sabbath. From there, Yahuwah went on to list the annual feasts (or mo'edim) but the very first feast He gave was the seventh-day Sabbath. 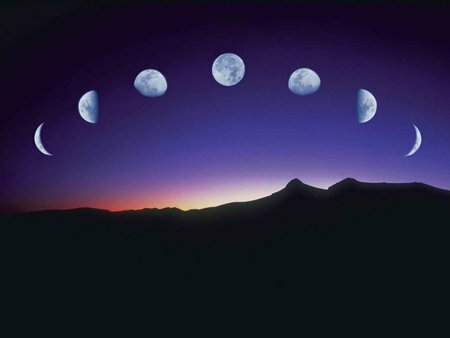 Lunar Sabbath: A holy day of rest, it is the seventh and last day of each week in a lunation. The weekly cycle restarts with each New Moon. Four complete weeks follow New Moon Day. The word here translated "seasons" is, again, mo'edim. The Biblical record is consistent: there is only one method of time-keeping presented in scripture. That is the lunar-solar calendar established by Yahuwah Himself at Creation. This calendar establishes all of the times appointed for worship, the mo'edim. always falls on the same dates of every month. On the Biblical lunar-solar calendar, each lunation (or lunar month) always begins with a New Moon day, which is in a class of worship day all by itself. Six work days follow on the second through seventh of the month. The seventh-day Sabbath always falls on the 8th, the 15th, the 22nd and the 29th of every lunar month. Scripture itself supports this calendar configuration. Every time the seventh-day Sabbath is given a numbered date in the Bible, it always falls on the 8th, the 15th, the 22nd or the 29th of the month. Either the actual date itself is assigned or contextual dates and other details consistently allow for that extrapolation. For example, the story of the Exodus from Egypt contains specific dates and details for three months in a row, all of which have the seventh-day Sabbath falling on the 8th, 15th, 22nd and 29th for each month! These calendar details were confirmed 40 years later at the time of Joshua and again at the crucifixion of the Saviour on Passover. The lunar-solar calendar of Creation is the most accurate method of time-keeping. It is elegant, precise. It is divinely designed time-keeping. Jeremiah 31:35 refers to Yahuwah giving the "ordinances" (or laws) of the moon. The ordinances of divine time-keeping are so simple that the shepherd on the hillside can be as accurate by observation, as the astronomer in his observatory is by calculation. Even the count to Pentecost, which has long confused people because the two specifics of the count seem contradictory, can be accurately figured only by using the lunar-solar calendar. Jewish scholars admit that the calendar they now use is not the calendar of Scripture. While it is true that the Jews today worship on a Saturday sabbath, this does not prove that it is the true Sabbath. They did not always worship on the Saturday sabbath. Jewish scholars are very clear that the original method of calendation was different from the modern calendar and that under intense persecution during the fourth century A.D., the Jews gave up their original lunar-solar calendar. Once the ancient lunar-solar calendar had been set aside, knowledge of the true Sabbath was lost with the acceptance of the pagan Julian calendar. These stone fragments of an early Julian calendar clearly show an eight-day week. The Israelites did not use the Julian calendar for finding the seventh-day Sabbath. They used the original lunar-solar calendar of Creation. 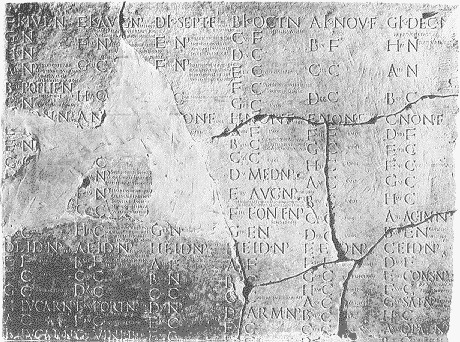 The calendar of the Roman Republic, like that of the Hebrew calendar, was also a lunar-solar calendar. In 45-46 B.C., Julius Cæsar reformed the original Roman calendar and, with the help of an Alexandrian astronomer, Sosigenes, created a new solar calendar with continuously cycling weeks: the Julian calendar. While the Julian calendar was in use at the time of the Messiah, the Israelites did not use it as the early Julian week was eight days long! The Israelites were still using their original lunar solar calendar and worshipping on the seventh day of its week. From that time, until the fourth century, Israelites and apostolic Christians continued to use the Biblical calendar for their religious observances. With the rising power of the paganized Christians in Rome, this led to a centuries long battle over when to remember the death and resurrection of the Saviour. The Christians in Rome wished to celebrate the Messiah's resurrection on the pagan Easter. Apostolic Christians, on the other hand, wished to commemorate Yahushua's death on the original Passover. The point of contention appeared deceptively simple: Passover versus Easter. The issues at stake, however, were immense. 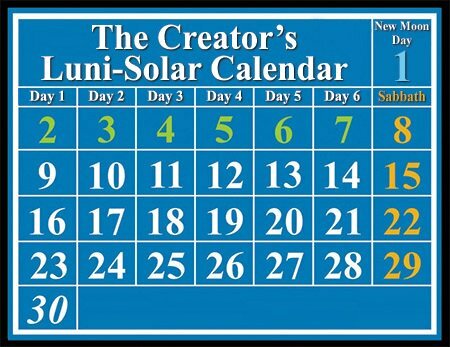 The only way to determine when Passover occurs is to use the Biblical luni-solar calendar . . .
Calendars calculate time and at the Council of Nicæa it was decided to set aside Jewish calculation and adopt the pagan Julian calendar. This effectively destroyed knowledge of the true Sabbath and substituted the pagan Saturday Sabbath in its place. Jewish scholars admit this fact, too. The Council of Nicæa had the most profound, far reaching effect upon the true Sabbath. To this day Catholic scholars base the authority of the Catholic Church on this act of changing the Sabbath from the true Sabbath of the lunar-solar calendar to Sunday on the continuously cycling Julian week. The pagan Julian calendar, legislated into place, an entire counterfeit system of religion. Thus the true Sabbath was buried under centuries of tradition and the assumption that the modern week has cycled continuously ever since Creation. The three angels' messages of Revelation 14 contain a call to worship on the true Sabbath of Scripture. This subject is of the utmost importance to all now living. The true Sabbath is the mark of loyalty that distinguishes those who are willing to obey from those who cling to tradition and assumption. All should study the subject of the lunar Sabbath, the related facts of calendar history, and pertinent passages from the Bible. The Battle of Armageddon, like everything else in the long-running war between Yahuwah and Lucifer, is fought on the battlefield of worship. All who desire to honor their Creator will choose to worship Him on the day that He has blessed and set aside: the seventh day of the week on the lunar-solar calendar, the true lunar Sabbath.